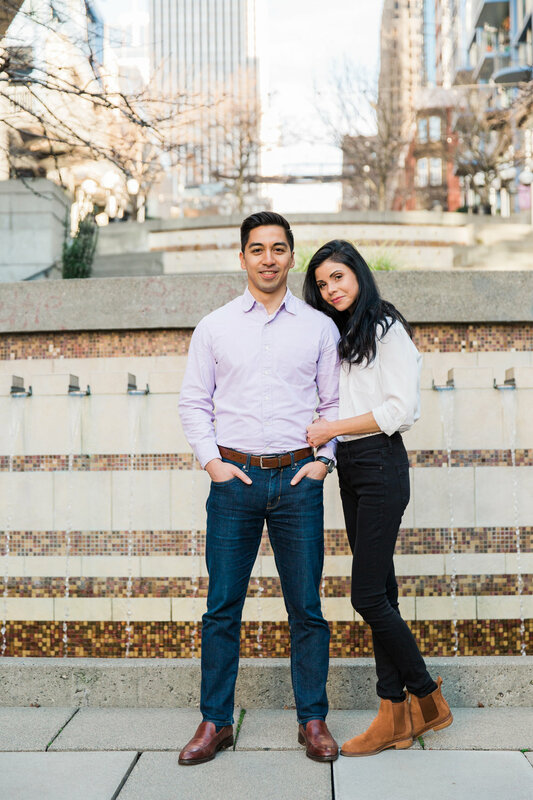 I met up with Tamara and Erwin at the Waterfront in downtown Seattle for this engagement session. Can I just say that it always surprises me that I can find my clients so easily among a crowd of people? There’s just a glow about couples coming to their sessions that makes them kinda easy to find. They might be nervous, but they definitely have a love about them that is so identifiable. Anywho, we took off and explored some of the pretty highlights around the waterfront area of Seattle. We even ventured to the beloved Pike’s Market Place. They trusted me every step of the way, which I took complete advantage of! Haha We laughed and talked and oh guys… how I love their love story!! It’s so sweet, THEY are so sweet. I’m so excited for their wedding day. I can only imagine the beautiful glow that will radiate that day from these two!